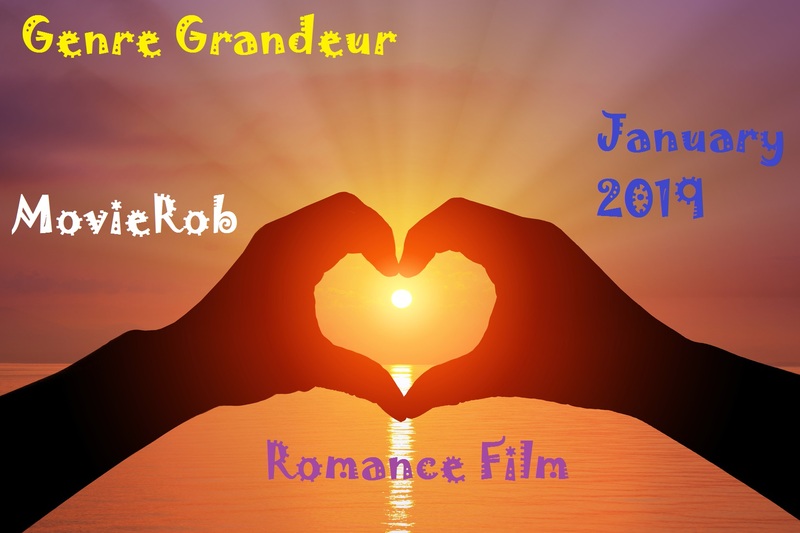 Thanks again to Samantha Ellis of Musing of a Classic Film Addict for choosing this month’s genre. 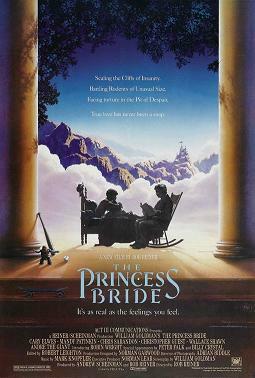 William Goldman published the novel The Princess Bride in 1973. Some of the facts behind it: It was originally published as a supposedly abridged “good parts” version of an original novel by “S. Morgenstern”. (“S. Morgenstern” is, in fact, a fictional person. Goldman was the actual writer.) Goldman writes the prologue to the book telling a story of having heard his father read this book to him as a boy, and buying a hard-to-find out of print copy of the S. Morgenstern classic for his son. His wife, a child psychologist, pressures him not to berate the boy when the son does not respond enthusiastically to the book as he did. When he gets a hold of the book and reads it, he finds it is not exactly the same book as the one his father read to him. Sure, the story is there, but there is a lot of political intrigue and mumbo-jumbo that his father had left out. Goldman decides to edit the book and bring it out as “the good parts version”, editing out all the mumbo-jumbo and just printing the fantasy/adventure/love story in the middle of the book. Occasionally during the story, Goldman interjects with some commentary on the parts he is leaving out, as well as some reminisces of how he, as a boy, responded to certain scenes and interrupted his father as his father read them. There are several things to note in the book. For one, the author Goldman has no son. (He does have daughters). For another, his wife is not really a child psychologist. And, obviously since he is truly the author, it is a fiction that his father read this to him as a child. Hence even the prologue is a part of the fiction of the novel. A note on the book itself. If you have seen the movie, but not read the book, you will almost surely believe the book is a novelization of the script for the movie. Undoubtedly both are almost exactly the same. But the truth is, as noted earlier, the original novel was published in 1973, and the movie was released in 1987. William Goldman, a fantastic scriptwriter in his own right (Butch Cassidy and the Sundance Kid, All the President’s Men both of which won Oscars, and numerous others) wrote the screenplay for this from his own book, proving he has an excellent ear for dialogue. If you haven’t read the book, I highly recommend that you do. 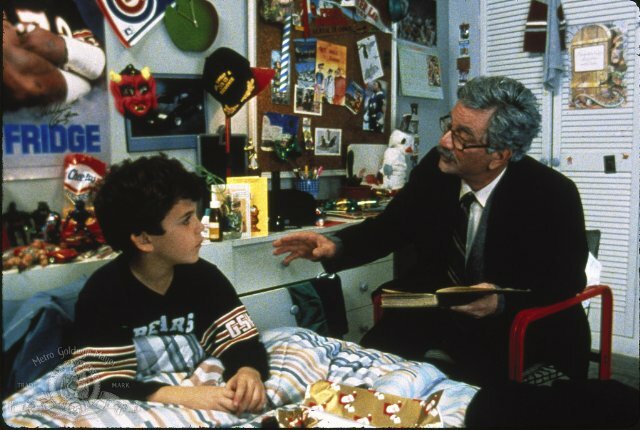 The transition from the book to movie includes several instances where the boy interrupts his grandfather in the reading of the story (and thus the action of the story part of the movie). Also frequently during the actual action of the film is a voice over that serves to remind us the story is being read aloud, rather than it being an event playing out before us. This helps to endear the grandfather and the boy to the audience, or at least it did to me. The story part introduces Buttercup (Robin Wright), who is initially a flighty, spoiled girl who enjoys harassing the farm boy who helps out on her daddy’s farm. 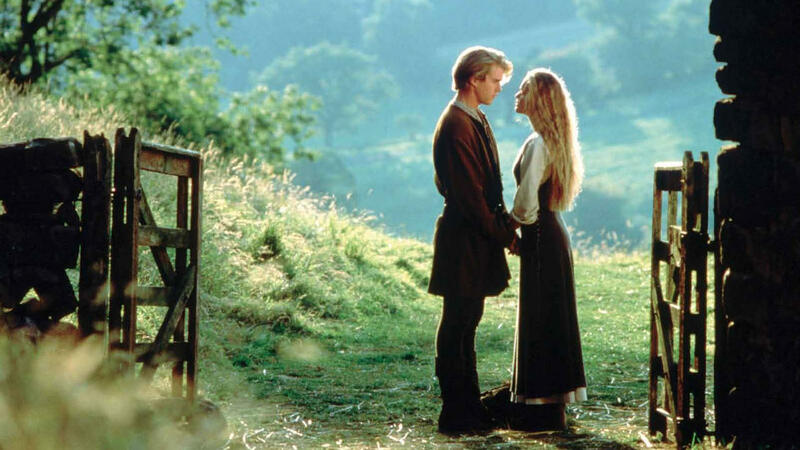 Eventually she grows to realize that the farm boy, whose name is Westley (Cary Elwes), loves her, and she loves him. He decides to go to the country across the sea to earn enough money to marry her. But she receives word that he was killed by an attack of the “Dread Pirate Roberts”. She states that she “will never love again”. But some time later, the prince of the country,Humperdinck (Chris Sarandon), who is privileged and spoiled rotten (and egotistical and ruthless and…but I’m getting ahead of myself) decides that Buttercup is the woman he wants to marry. She agrees even though she tells him she can never love him. 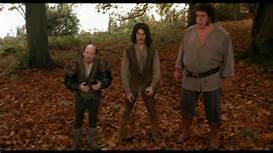 Shortly after the engagement, Buttercup is kidnapped by a trio of cutthroats; Vizzini (Wallace Shawn), Inigo (Mandy Patinkin) and Fezzik (Andre the Giant). As they try to make their way to the frontier of the neighboring country of Guilder, they are pursued by a mysterious Man in Black. 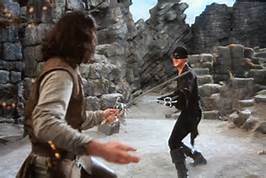 In succession the Man in Black defeats the three in separate encounters, beginning with Inigo, who is an accomplished swordsman (in an excellent sword fight on the Cliffs of Insanity, which is as great for the fact that both actors did the actual stunts, as it is for the fantastic repartee during the fight, courtesy of William Goldman). The Man in Black then encounters Fezzik, whom he defeats, surprisingly, in a wrestling match. In a final battle of wits, the Man in Black defeats Vizzini (which ends up with the death of Vizzini), and takes Buttercup as his own prisoner. 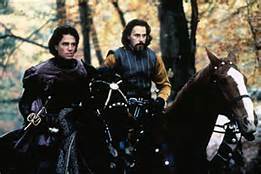 Meanwhile, the Prince, and his right hand man, Count Rugen (Christopher Guest) are pursuing the original kidnappers, but find that they have each been defeated, so they turn to their new prey. 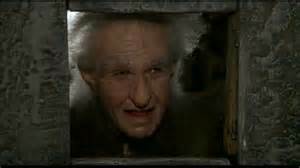 When they are about to ride up to capture them, the Man in Black reveals to Buttercup that he is Westley. She, of course, is overjoyed that her love is still alive, and they disappear into the Fire Swamp to hide from the Prince. But after many adventures in the swamp, they come out to the other side only to find the Prince waiting for them. He tells Buttercup that he will take Westley to his ship, but after she leaves, has him taken prisoner instead. Will Westley and the gang rescue the princess? Will Inigo get his revenge on Count Rugen? Watch the movie and find out.